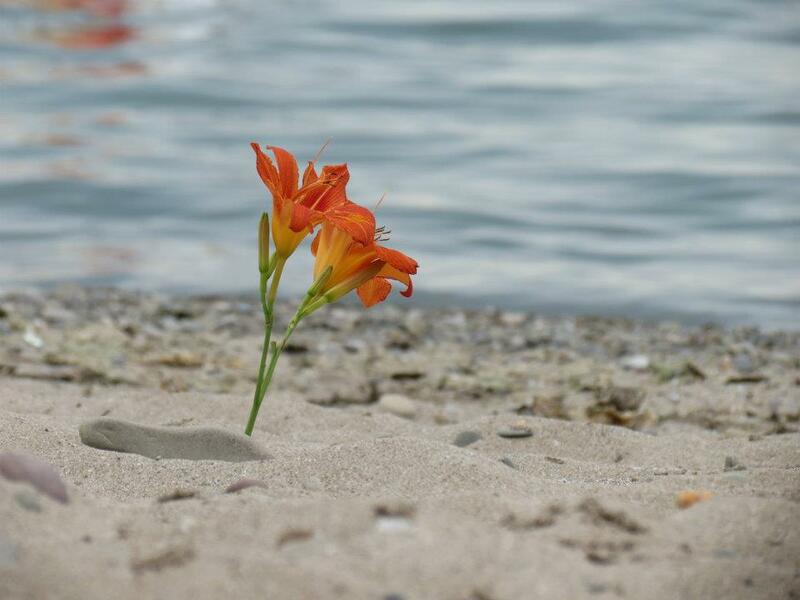 Photo by Amy taken at the Geneva State Park.beach. The 4th of July is a big deal with me. Maybe it’s because my birthday is in the same week and as a kid, it always felt like the fireworks were a celebration just for me. We often take vacation the week of the 4th and have watched fireworks displays in many different places. In Maine, Doc and I watched the most painfully slow fireworks show. One firework at a time with a long pause in between stretched the show to an hour and a half. Sitting at a burger stand somewhere between Iowa and Wyoming we were surprised when fireworks began to burst in the sky above us. Unbeknownst to us, we had pulled off the highway to have dinner next to a township ball park where the local 4th of July festivities were underway. In Chicago we watched a spectacular display while sitting in the middle of a closed freeway with a million other visitors. Our most recent July 4th fireworks sighting was on a family trip to Arizona. Fireworks displays are apparently not very popular in Arizona. We’d been asking people all day and no one knew of any. Okay, it makes sense. Arizona in July. I suppose fireworks would be a big fire hazard. But finally, our dinnertime waitress said she thought we could see them at a local mall. As the sun went down, Amy, Bill, the boys and I found a parking spot behind the mall that we thought would give us a great view. More and more people packed in around us. At 9:30 we looked into the night sky, expecting a big boom and a showering of colorful sparks. Instead, we heard a small “pop.” We looked around. “Pop, pop, pop, pop, pop.” Green and blue balls shot up about 15 feet from the ground. Amy and I looked at each other in disbelief. For the next 20 minutes we sat with hundreds of others and watched the same amateur fireworks display that Dad sets off in the backyard. While most of our surrounding local communities have begun holding their fireworks celebrations on July 3rd or July 5th, or even the 6th or 7th, in an effort to save some dollars, when it is the 4th of July, I want to see fireworks TODAY. Not tomorrow. Not yesterday. 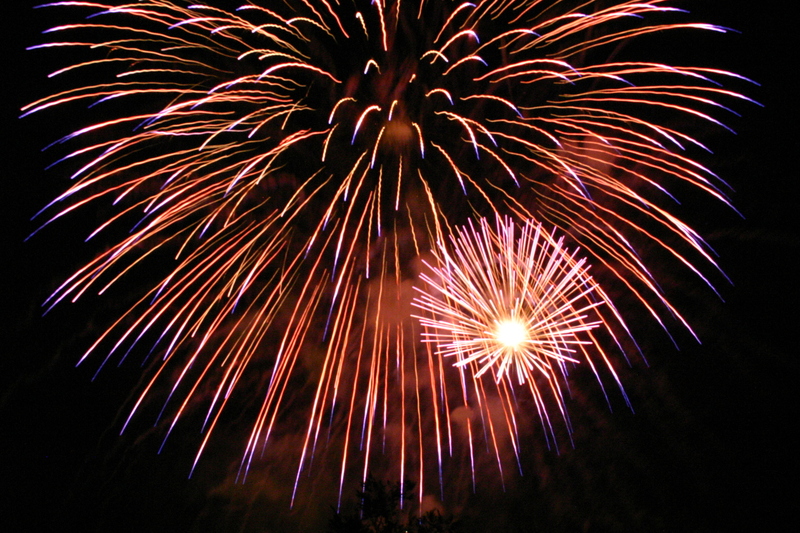 Along with the family picnic and the backyard croquet tournament, July 4th fireworks are a tradition. And when we’re celebrating at home we know, as does everyone else in Ashtabula County, that if you want to see fireworks on the 4th of July, you have to head for Geneva on the Lake. You won’t find McDonald’s here. You won’t find any of the mainstream fast food restaurants. 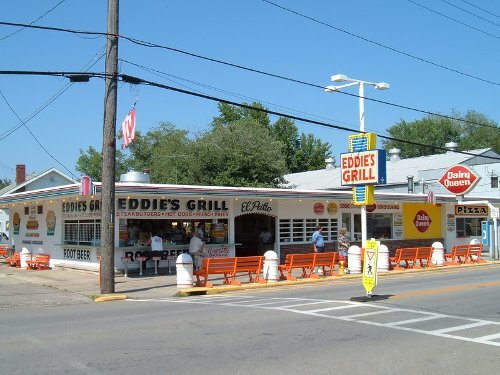 Instead, tasty, old fashioned burgers and foot long hot dogs are served at the locally famous, open air “Eddie’s Grill.” Fish sandwiches and fries can be had down the street at “Times Square.” And no place, and I mean no place anywhere, makes a pizza as good as Capo’s on the corner of New St.
You won’t find a Holiday Inn either. Instead of chain hotels with modern amenities, visitors find lodging in 1950’s style summer cottages, motels and campgrounds with swimming pools or beach access. There is the beautiful Geneva State Park Lodge and equally pretty Lakeside Inn for those who want modern accommodations. But most places, you will find that you are more likely to have a grill outside your door than room service. Because we live locally though, we don’t need food or lodging and unlike the tourists, we don’t have far to drive to see the fireworks on the 4th, just the 4 or 5 miles north from town. That’s the good news. The bad news is — all of those people from surrounding communities who are disgruntled because their own fireworks aren’t on the proper day? Well, they’re coming to Geneva on the Lake too. And the traffic overwhelms this tiny village. A few years ago, Amy and I made the mistake of approaching the strip from its east end. Traffic coming from the neighboring town of Ashtabula backed us up for nearly an hour. We managed to find parking in the public lot behind the Visitor’s Center and we watched the fireworks from a golf course green. It was great fun. But it took us an hour to get out of the parking lot. And that was after spending an hour walking the strip and getting ice cream in order to allow the traffic to ease up a bit. The following year Dad and I rode to “the lake” with my sister, Julie, and her husband, John. We watched the fireworks and somehow managed to get off the strip and be on our way home lickety split. Halfway home though, my sister had the bright idea that we needed to take home a dozen doughnuts. 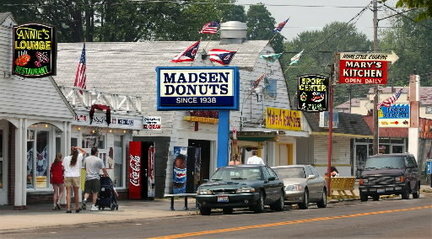 Now everyone knows that the best doughnuts are made by Madsens. And where is Madsens? On the strip, of course. John turned the car around and headed back the way we had just come, expecting the fireworks crowd to have disipated. But as we approached the outskirts of the resort area we hit a line of stop and go traffic and it took nearly an hour to drive the last mile to Madsen’s. There was no point in turning around. With only one road in and one road out, the traffic going the other way was just as bad. By the time we hit the strip the car was overheating. Steam streamed from the radiator as we got lucky and pulled into a parking spot along the street just as a Ford pick-up was vacating it. My sister got her doughnuts but by the time we waited for the car to cool off we didn’t get home until after midnight. Dad hasn’t been to a fireworks show since. He thinks it’s less trouble to set off bottle rockets and other sparkling gems in the backyard that he buys from the fireworks store across the state line. Like me, Dad has always been a 4th of July fan. I remember one year when he and his friend Ronnie were digging around in a closet, probably looking for some old radio tubes (in those days they were into radio repair). Instead Dad found an old package of firecrackers. It happened to be the 4th of July. It also happened to be about 10:00 at night, a good hour, my father knew, beyond the bedtime of our next door neighbor, Clyde Rose. Ronnie argued that the firecrackers were too old and probably wouldn’t work anymore but Dad had a sparkle in his eye and an idea in his head. He got a box of matches out of the kitchen drawer and (much to my mother’s horror) slipped out the back door and across the yard to Clyde’s bedroom window where he lit the entire string of firecrackers and then ran as fast as he could back to our kitchen. The distant bangs could be heard as Dad ran in through the kitchen door, laughing and laughing as he imagined Clyde shooting up out of his bed! I don’t know if Dad ever fessed up to the neighbor or not but it made a good story for months to come. ← Weekend at Watkins Glen State Park and the Corning Glass Museum = Spectacular!